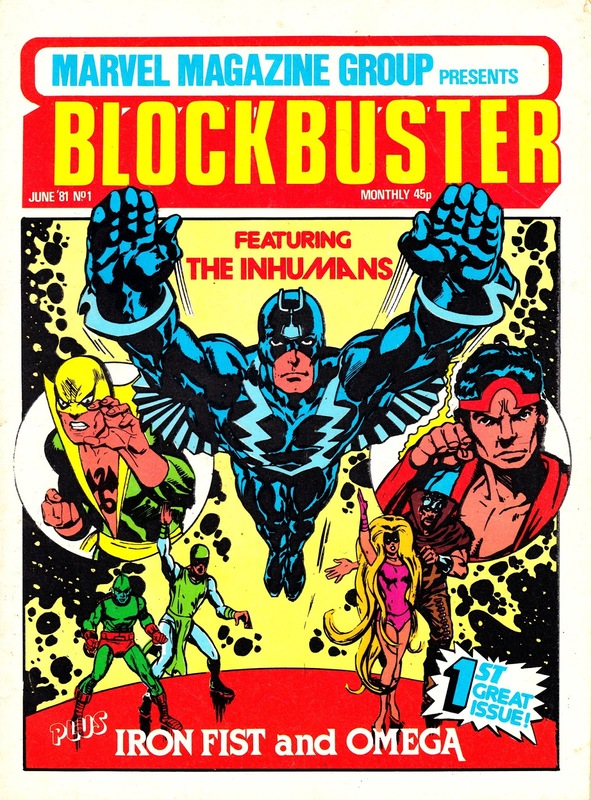 From June 1981: Probably the most improbably titled series from the entire MARVEL UK oeuvre: the launch issue of BLOCKBUSTER monthly. The Annex of Ideas tested the title (with a line-up of Thor and Omega) the previous Winter but cobbled together different contents for the ongoing version. Omega returned, now accompanied by the b-list line-up of Iron Fist (last seen in the previous year's MARVEL SUPER ADVENTURE WINTER SPECIAL) and the Inhumans. Three perfectly serviceable strips but hardly a combo worthy of the title. Interestingly, Marvel adopted the US Marvel Magazine Group house style for Blockbuster's cover design. As far as I recall, this was the only place it was rolled out here... adding to the impression that this was an outsider even within the ranks of the British Bullpen. Blockbuster eventually ran for nine issues before succumbing, in the traditional turn-of-the-year cull of under performing titles, the following January. The last issue was dated February 1982.